Foundations are built to support structures and keep water out, but they can be easily compromised by water intrusion and hydrostatic pressure. In fact, these are the two major causes of foundation wall leaks in homes in the Chicago area. Homes built in the last 20 to 30 years probably have poured concrete foundations built with masonry. As the masonry units wear away over time, wall cracks become the source of entry for water. So where does the water come from? As excess water builds up in the soil, it causes pressure against the foundation walls. 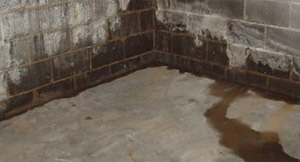 This causes the foundation walls to bow, or crack, resulting in water in your basement and serious foundation problems. One top basement waterproofing problem is foundation wall leaks. If you have foundation wall leaks, contact United Structural Systems immediately to prevent costly repairs and further damage. If you have any of these issues, get professional help by United Structural Systems. in Chicago. After all, your home is one of the most important investments that you can ever make, so fixing your water problems immediately will prevent further damage. We've seen many types of waterproofing issues ranging from water seepage from floors to overflowing window wells. Whatever issue you have, our experts are here to help. Foundation wall leaks can go undetected for years until foundation problems arise. If you have foundation wall cracks, we can protect your investment with a heavy duty sump pump. A sump pump is an electric pump that is installed in the lowest area of the home which is usually in the basement. 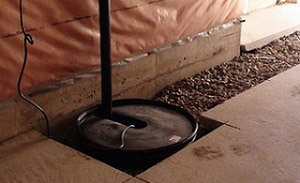 Sump pumps work in combination with a sump pit to collect and pump out water; they are extremely useful because they prevent water leaks in basements. If you have a malfunctioning sump pump, we can inspect it and repair it. We'll check the valves, float switches, and discharge line opening. We also offer battery back up pumps that protect your home from floods in case the primary pump fails or if the power goes out. Interior waterproofing is a less invasive, inexpensive waterproofing method used for poured concrete foundations. It consists of a drain tile, a perforated pipe that helps relieve hydrostatic pressure in the soil under the foundation. When the drain tile is installed inside of the foundation footings, it decreases the pressure and directs water to a sump pump. Exterior waterproofing is a comprehensive system of foundation protection. This system consists of a waterproofing membrane with a drain tile. Since water enters basements through deteriorating mortar joints and concrete blocks, a waterproofing membrane is applied to the foundation wall. A drain tile is also installed along the footing, and a drainage board is used to cover the membrane. This helps direct water to the drain tile that flows to the sump pump.